Roxy Saint is currently a "DVD-only" artist, meaning you can't pop her latest CD into your car stereo as you drive to and from your favorite bar and/or concert venue. That's too bad, because Roxy's music is rough-edged, funky punk with a sly, mysterious attitude. (Okay, actually, you can play it in your car - purchasing the DVD gives you a link that allows you to download the music from Roxy's website). Her DVD, "The Underground Personality Tapes," is a bizarre little creation, part travelogue, part character study, part music video, part experimental filmmaking. It'll make you laugh, it'll make you bang your head and it'll make you think. What it won't do is bore you. The entire DVD is filmed and edited like a high energy MTV video (when MTV still played good videos). Roxy is reportedly inspired by the likes of David Lynch and Andy Warhol and their influences are obvious throughout. Images change and move in ways that will constantly hold your interest but not necessarily fill you in completely on what's going on. Musically, Roxy falls somewhere between Joan Jett and Marilyn Manson. Her songs are all guitar driven and, again, buoyed by that sly, mysterious attitude. Because this is a "DVD-only" release, it's difficult to talk about the songs without the visuals but that's okay - the images Roxy conjures up seem to fit each song as though the songs were actually written about them. It helps that Roxy is such a chameleon. Watching the entire DVD doesn't feel so much like a string of someone's music videos, but rather like a bizarre, full-length rock'n'roll movie. Perhaps as impressive as the music and images contained on "The Underground Personality Tapes" is the effort and confidence that Roxy displays in taking this route to get her music out there. Segments of "The Underground Personality Tapes" have become favorites over at http://www.ifilm.com, and this DVD release is definitely worth a look ... and listen ... as well. 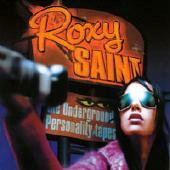 It'll be interesting to see where Roxy Saint takes herself in the future. For more information, check out http://www.roxyroxy.com.